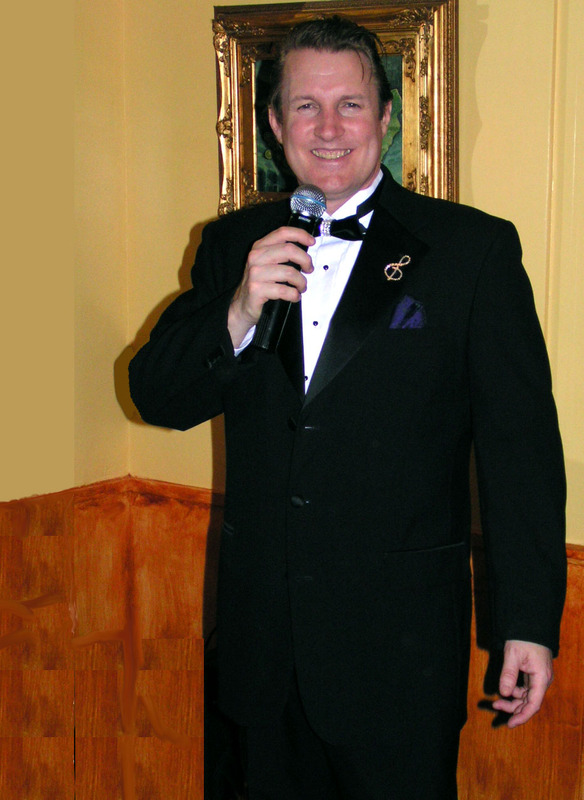 Mark Hester Power is Bay Area based Tribute Singer, Crooner, Entertainer, Singing Impressionist, Vocal Impersonator & DJ. He has been performing at parties, wedding receptions, & restaurants around the SF Bay Area for 25 years. He is known at the San Rafael and Novato Farmers Markets as the guy who sings in a Tux with Top Hat while dancing on roller skates. Whatever your event; Mark can personalize a musical program just for you. For weddings Mark is a hybrid DJ / Singer, he can sing, one, two or as many songs as you like everthing else he can play as a D.J. Mark doesn’t dress up or try to look like Elvis, Sinatra, Prince or Tony Bennett or any of the dozens of artists that he performs. What he does do is to capture the spirit of the original singers and then adds his own vocal stylings. Mark sings the songs of the Rat Pack, Frank Sinatra, Dean Martin and Sammy Davis Jr. in his Las Vegas lounge singer tribute. He can do a crooner tribute and sings the songs of Tony Bennett, Nat King Cole, Bobby Darin, Frank Sinatra, Johnny Mathis, Etc. Having a 50’s party? Mark can also perform a Oldies and Rock and Roll Tribute show featuring such songs as The Twist, Johnny B. Good, Little Darlin, as well as many songs by Elvis Presley, Roy Orbison and others. Mark can also perform a dance & disco tribute show, an 80’s tribute or any combination you want. He can also supply the sounds system and the show. Although he lives in the Bay Area, Mark will travel to anywhere you want him. His primary work cities are Mill Valley, Tiburon, Sausalito, San Rafael, San Francisco, Santa Rosa, San Jose Petaluma and Palo Alto. Serving Marin, Napa, Sonoma, Alameda, Contra Costa San Francisco and San Mateo Counties in northern California, CA.